The path to the application you want AB Commander to run whenever you use the external Quick Editor. The command line to be passed to the external quick editor. The following character combination, %1, may be used in this field to denote the full path of the file currently selected in a panel. If checked, this option causes AB Commander to substitute the short DOS alias for the full path of the selected object, in place of the %1 specification in the command line. This option is useful if the external Quick Editor application you use does not support long file names. If this option is not checked, the regular long path is used. 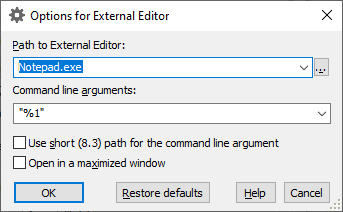 If checked, this option causes AB Commander to open the external Quick Editor application in a maximized window. If checked, this option causes AB Commander to restore the options displayed on this window to their default values, as they were when you first installed AB Commander.